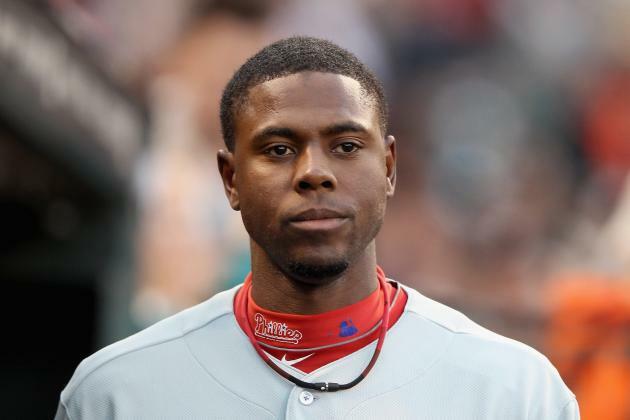 The Phillies have traded John Mayberry Jr. to the Blue Jays for Gustavo Pierre, an AA third baseman with decent power but who walks less than Juan Pierre (but more–though not much more–than Ben Revere). In other words, a Ruben Amaro Prospect. The Royals would do just as well trying to pick up John Mayberry Jr. from Amaro (too bad Francoeur’s not still a Royal, it would be perfect) and platooning him with somebody who could hit RHP (David Lough?? ); Mayberry’s making $517K this season and won’t become a free agent before 2017. I’ve always been convinced [Mayberry] would follow his father’s footsteps and be half of a decent Royals’ platoon outfield someday, although Dayton Moore has apparently followed my advice down to everything including the same initials but with the wrong trade partner, acquiring Justin Maxwell, who is basically the same player a month younger and without as drastic a platoon split, curiously enough also from Houston, who gave the Royals John Mayberry Sr. in 1972. Dayton can cut me that check now. Both Mayberry (along with his former doppelganger Maxwell) had an off year in 2014, but we’ll always have this. With an outfield-first base mix of Revere, Brown, Sizemore, Byrd, Ruf, and the Immovable Object, all of whom (with the exception of Sizemore, who at more than a spring training invitation is probably a mistake) are on the roster for 2015 barring a trade, Phillies had no room for Mayberry, who’s still officially injured. 1.1 bWAR across six total seasons (though only 1252 AB) is underwhelming, even for a platoon player. But if nothing else, he was worth more than Greg Golson. This entry was posted on September 1, 2014 at 11:49 pm and is filed under 2014 Phillies. You can follow any responses to this entry through the RSS 2.0 feed. You can leave a response, or trackback from your own site.